In most cases, a deceased person’s estate must pass through a court process called probate. Probate is often required regardless of whether a person left a will. If the decedent owed any money at the time of death, those creditors must receive notice of the death. The creditors have the right to file a claim with the court asking for payment of the debt. 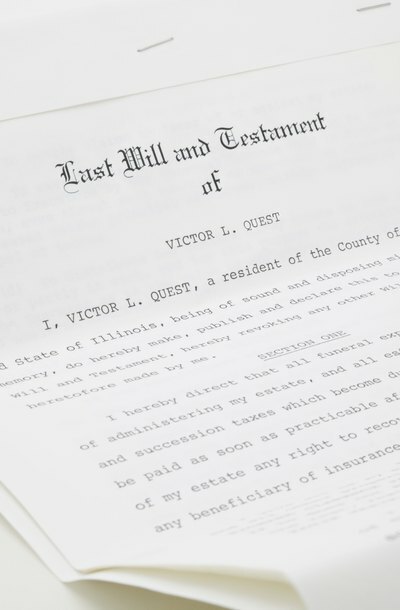 The executor or administrator takes an inventory of the decedent’s property, pays off creditors and distributes the remaining assets to the beneficiaries of the will or, if there is no will, to the deceased person’s family members in the order specified by state law. Some states have an abbreviated probate process referred to as simplified probate. Simplified probate is generally reserved for estates with a relatively small net worth. In California, for example, an estate valued at under $150,000 at the time of death qualifies for simplified probate if the estate consists of only personal property. Some estates are not required to pass through probate, whether formal or simplified. Property held in a living trust, for example, does not have to pass through probate because the trust, rather that the trust creator, owns the property. Some assets, such as insurance policies and investment accounts, allow the account holder to name a beneficiary of the account proceeds. The beneficiary automatically receives the proceeds upon the account holder’s death, so probate is not required. The primary responsibilities of executors and administrators are to collect the decedent’s property, pay his debts and distribute the remaining estate assets to the beneficiaries named in the will or, if there is no will, to the decedent’s heirs in accordance with state law. The duty to collect the decedent’s property also includes the duty to secure it to ensure that it does not become damaged. Creditors include funeral service providers and taxing agencies. If the decedent died intestate, the administrator must also locate the decedent’s heirs. Executors and administrators often require the assistance of experts such as lawyers, accountants and appraisers. Funds from the estate may be used to pay for these services. After the executor or administrator has paid the decedent’s debts and distributed the estate assets, she is ready to close the estate. The steps she must take vary by state law. Generally, she files some final paperwork, including an accounting, for the court’s review. The accounting provides the court with information about the estate assets, the creditors, the amounts paid to creditors and to whom the assets were distributed. Some states may also require the executor or administrator to attend a final court hearing to address any questions the court may have.